Thanks so much for your work on Sophie's brace. I inherited a Pomeranian (Sophie) when my dad passed away. 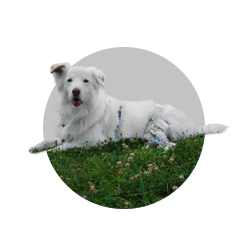 We were aware at this time that she suffered from hip dysplasia. Unfortunately one day while playing with another dog she popped her patella (knee cap) out of place. After x-rays, the vet informed me that there was nothing that could be done due to her age and the extent of the damage. I even took her to a specialist in Toronto to be told he could perform a hip replacement but could not promise any improvement due to the damage of her knee. I was devastated as she could no longer walk since her bad leg just stayed tucked under her tummy. Luckily I heard about Janice and was willing to try anything that may help. I cannot put into words the difference the brace has made and given to her quality of life. Sophie now walks everyday - SHE EVEN RUNS!!! It has increased her mobility 100%. 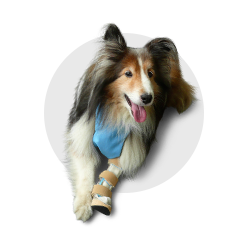 Our dog Aldo had an accident in which the tendons and ligaments in his foot were torn. We were given two options -surgery or a brace. After hearing from a surgeon a full and honest description and what to expect from an operation, and knowing the kind of active dog we have, we opted to have Janice do a brace for Aldo. 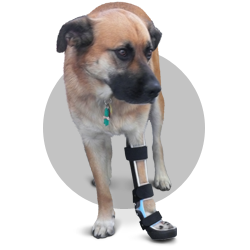 We are forever grateful to Janice for enabling Aldo to walk on four legs again. From the first meeting to dispensing, and adjusting of the device, Janice has been kind, professional and knowledgeable. We are very impressed and appreciative for her promptness in addressing our concerns and questions. We are three very happy clients. Make no bones about it! I'm back on my paws again! (Ok, ok, with help from the brace!) Thanks to PawsAbility - you're the best! The "Doc" gave me the thumbs-up today - he actually said that she didn't need to see me anymore. I wan't offended: I don't particularly want to see her again either! I LOVE my brace and I can do everything (well maybe not swim) in it. WOW! Thanks so, so much for your great work. 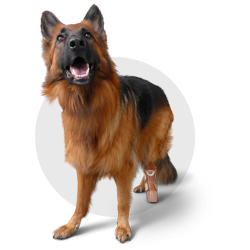 I contacted the clinic to ask about the possibility of having a device made for our German shepherd Lexi. 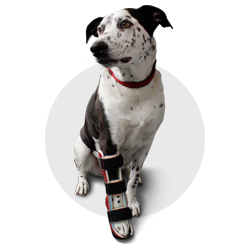 Janice created a prosthetic device for Lexi and even had it covered in a rich brown colour to blend with Lexi's beautiful red and black coat. Lexi hasn't looked back - she runs, jumps, and plays like never before. The prosthetic device is changing Lexi's world. Thanks to Janice for knowing how to help our girl. 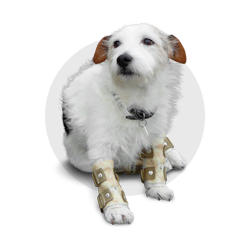 We own a small Jack Russell that began to exhibit mobility issues at the age of only 8 years. 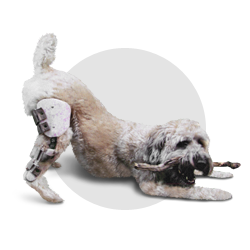 Initially, beginning with a limp, he quickly progressed to full lameness on all four legs by walking too low on his hind legs and experiencing hyper extension on his front wrists and no longer walking on his front pads. Walks became increasingly more difficult and we discovered PawsAbility by accident on a walk when someone who knew Janice recommended her. After meeting with Janice, she provided some suggestions in terms of possible mobility solutions. After taking molds and fittings, Bandit was a new dog within two weeks. Now he can enjoy longer walks and he is the talk of the neighbourhood as he enjoys his daily strolls. Thanks so much Janice for all your support and help, giving Bandit his independence and enjoyment of his daily "meet and greet" of all of his doggie buddies! 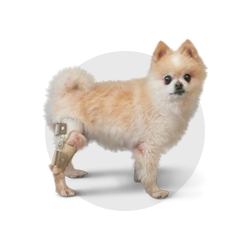 When Casey was three months old he was hit by a car and suffered severe nerve damage in his left front foot that left him unable to walk. A month later, we adopted him on the eve of his leg being amputated. We took him for a variety of therapies in the quest to save his leg and teach him to walk. A few months later, we met Janice at PawsAbility. She fitted Casey for a brace and changed his life. He walks and runs with confidence on four legs. He plays with other dogs, runs around the yard, and digs in the garden. Nothing holds him back. He stretches his leg out every morning to have his brace put back on. If we don't do it right away, he goes to get it himself. Thanks to Janice and PawsAbility, Casey is just like every other dog out there - happy and active. Well it is only a couple of weeks since we met and I am constantly singing your praises. We are so grateful for the work you have done for Jersey. She willingly wears her brace every time we go for a walk or run. Thanks to you, she has her regular life back and she is a happy dog again. We just wanted to follow up with you so you would know how it was going for her. Thank you once again. How do you begin to thank someone for giving your beloved dog the chance to live a happy and normal life? This is the story of our Hope (Dreamkeeper Northern Cross). Hope is a beautiful English Golden Retriever that was given the opportunity to be special. Hope was born in a large litter and had the umbilical cord wrapped around her paw. As a result, her paw did not develop 100% and was not as long as her other front leg. Hope was fit for her first orthotic at 3 months old and apparently, took to her new brace as if she wore it all her young life. 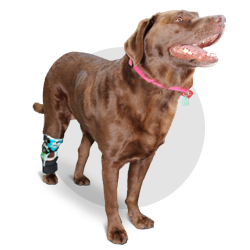 When wearing her orthotic, she was able to run and play with her litter mates and her slight imperfection has only made her more special. As Hope grew, her orthotic needed to be replaced. At slightly over 6 months old, Hope was fit for her second orthotic. It was at that time, the stars aligned and we found out that Hope was up for adoption. 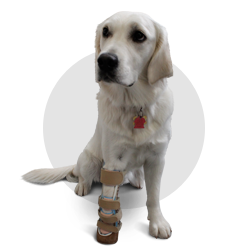 On our first visit, we met her with her brace on and she was running around the large water front property .When we saw her paw for the first time, we then understood the true benefit of her orthotic. Hope is able to get around without her brace, but wearing it when walking, running and playing makes her 'just one of the dogs'. Just before her first birthday, we made our visit to Janice to have an adult orthotic made. We were able to do this in two fittings and selected a Leopard print material for her new orthotic. Just recently, we had some minor maintenance done to replace the rubber bottom and the leather around the base of the orthotic. We must admit that our vet was very sceptical about her orthotic until he had a chance to meet Hope for the first time in person. He was so impressed and his first comment was that he knew of a couple of clients whose dogs could benefit from Janice's work. We find it hard to think of what her life might have been like if she was not given the opportunity to find Janice at PawsAbility, but we do know her life is pretty perfect as a result. 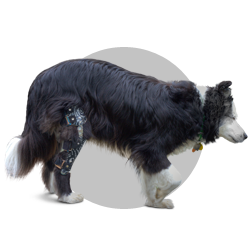 We can't believe how well Meggie has accepted the knee brace. Right from the beginning it seemed as if she knew that it was a good thing - she stands like lamb to have it put on (in the beginning we gave her a biscuit when it was on but that very quickly wasn't necessary). She's running outside now - her gait is still a little strange but she's comfortable even now on the snow and ice. We took her into our vet's office to show her brace off and they were hugely interested - took it off and put in back on , etc. - Meggie tootled around the office showing off like mad. I think there will definitely be some referrals coming - we told them that we would be more than happy to talk to other dog owners in the same predicament or have them come to our house to see Meggie in action. Thank you so much, Janice. David and Carolyn thought you'd like to see this picture of me playing in the back yard. I can run like mad and especially with a stick in my mouth. I have a bit of trouble going up stairs though� I guess I'm still feeling weird with it on. I don't like being around other dogs too much now as it makes me feel vulnerable but all in all - no pain, I can run and I owe it all to you!! I'm not sure if you remember us but you made a brace for Shiloh back in November. She is doing so well with it! It's amazing what it has done for her quality of life. She has worn it every day up until a few months ago where we noticed she didn't need it as much anymore. I think it actually encouraged her knee injury to start healing. AMAZING STUFF. We went for a walk today and she was walking like a normal dog with no limping at all. It looks like some kind of miracle. Well my entire family thanks you so much again! Honestly, that brace was the best money I have ever spent. Shiloh is much much happier and she acts like a young dog again! She can finally enjoy her cottage life again! Two years ago, my Australian shepherd, Emma, suffered injuries to both knees. 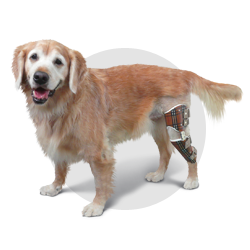 The tear to the cranial cruciate ligament of her left knee and the tear to the joint capsule of her right knee could be surgically repaired if she had only one of those injuries at a time. Because both knees were injured at the same time, surgery was not a viable option. There were no options available other than reset and chances were slim that she would recover with rest alone. Sadly, Emma was having difficulty with even the most basic things because of pain and instability. Then we met Janice at PawsAbility. Janice made braces for both of Emma's knees. Emma felt comfortable in them almost immediately. She quickly gained confidence in her new orthotics and within the first couple of days discovered she had the support she needed to make the most basic tasks easy and comfortable. Soon she was running and playing again and there has been no stopping her since. Emma's braces gave her life back! They give her the support and stability she needs to a "normal" dog. While wearing her braces she goes on the same walks and hikes as my other two dogs, chases and plays with other dogs and barks madly until it is her turn to catch the Frisbee which she jumps up for and catches in the air! In the two years she has been wearing her braces, Emma left knee has healed well but we have discovered that without her braces her right knee injury is recurring so she will happily wear her braces for activity for the rest of her life. I hate to think of what Emma's fate would have been had we not been so fortunate as to have met Janice and had braces made for her. We are grateful we will never have to find out.